If you’re looking to update the feel and look of your bathroom, we have good news for you. We have bathroom design ideas that’ll change any dull looking bathroom into something you look forward to using every day of your life. One of the ways that are being employed to transform the modern bathroom is by using colorful shower designs. A walk in shower is a must have for those who are looking for a modern-looking bathroom. It also helps create an illusion of a more spacious bathroom. A walk in shower can either be made of a single toughened glass panel or with two glass panels to achieve a full enclosure. So many of our clients lately are requesting walk in showers for small bathrooms even though their square footage is extremely limited. Obviously this is a challenging request because they tend to take up a lot of room in order to be large enough to bathe efficiently, yet floor space is just the thing that these small bathrooms are lacking. One way that I have learned to work around this issue is by creating an open concept bathroom. I took inspiration from spa bathroom designs that do not have doors or stalls, but instead the entire space is a wet room with a drain in the center. 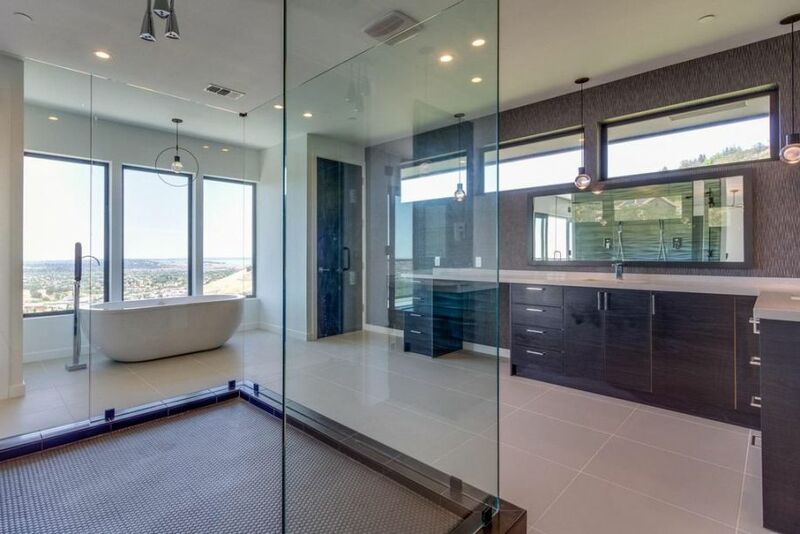 As you can see from this home we recently finished, there is no real delineation between shower, vanity and general open space, they are all one entity that flows together. Bathtub doors are a great add-on feature to help make the bathroom safer and more accessible to those with disabilities or elderly folks that may have trouble with standard bathing units. Even better, these unique products can look quite decorative and blend in seamlessly with the rest of your decor rather than standing out as an unconventional bathroom feature. 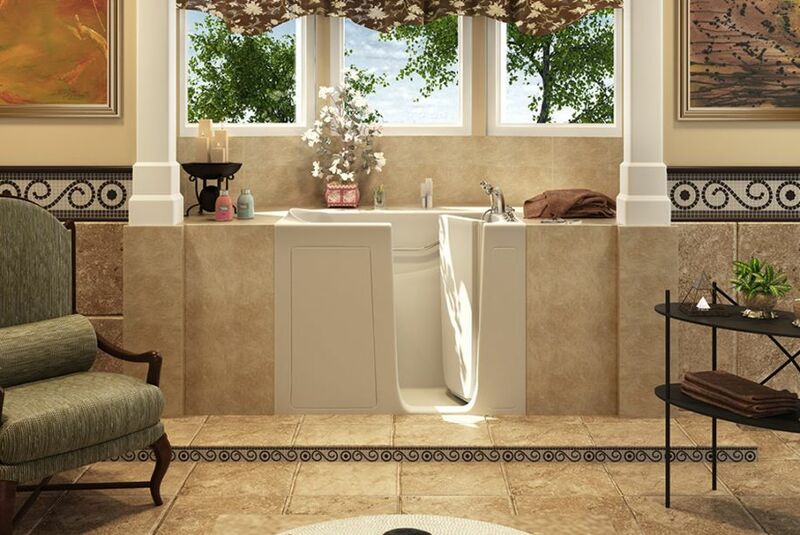 If you are going to add an accessible walk in tub shower to your home, treat it as any other piece of your design. Keep an eye out for color palette and decor so that the unit you select blends well with the existing (or new) tile, trim, and paint palette. 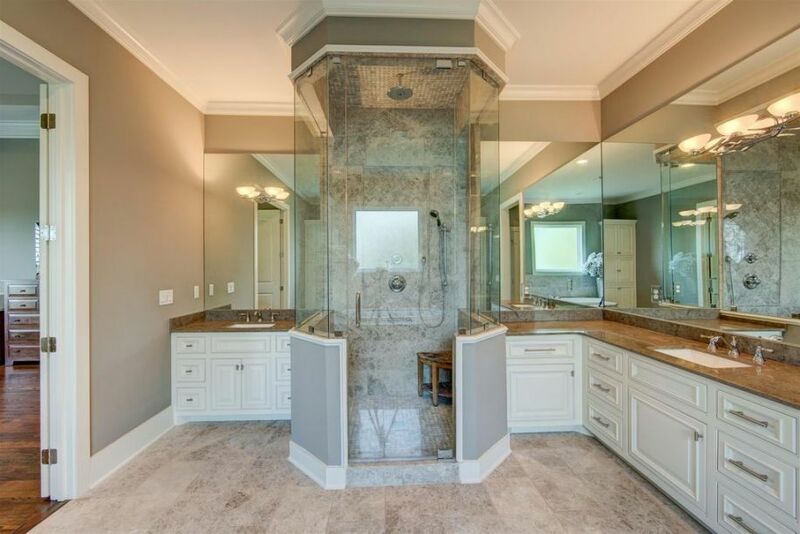 One of the trends I am seeing a ton of in 2019 is glass shower walls as opposed to your traditional tile enclosed stalls. I must admit that I think this is an interesting design because it leaves you feeling quite exposed in the bathroom. I myself prefer a bit more privacy, especially when showering, but I do admit that I love the look of these gorgeous frameless designs. I am always attracted to simple clean lines and sleek contemporary designs that don’t have much added fuss to them. This bathroom is a fantastic example of this because, although it has quite a huge shower, it still seems very open and bright. This is the ideal look for a bathroom walk in shower in my home because it doesn’t distract from the other interior decor I want to bring to the space. I have always been intrigued by bathrooms that have showers without doors placed in the middle of the room where everything else is. They always feel so spa-like to me and have a very luxurious feel. I can’t imagine the freedom of just walking in and out of your shower without having to worry about pesky doors getting in your way. We have been on the look out for walk in shower designs for our new bathroom we are in the process of planning. 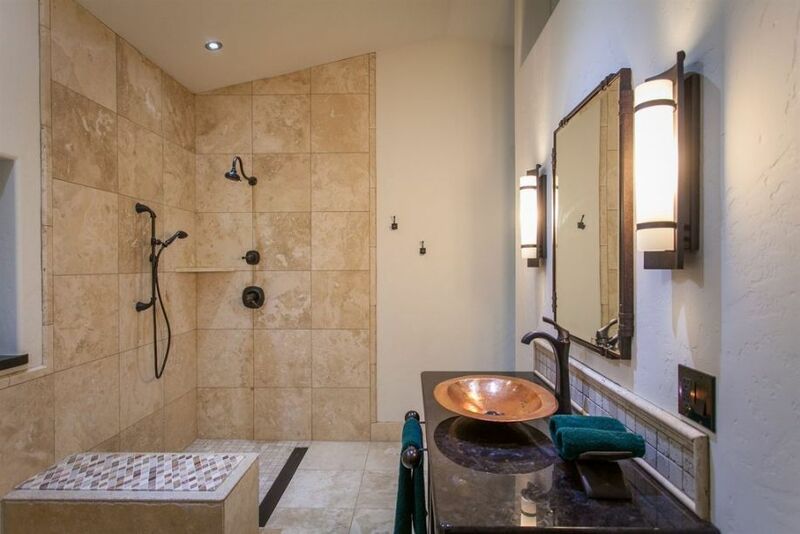 I would love to add a spa shower room that has multiple shower heads and perhaps even a steam feature. I really like the design of this one because it is subtle and still quite traditional looking. 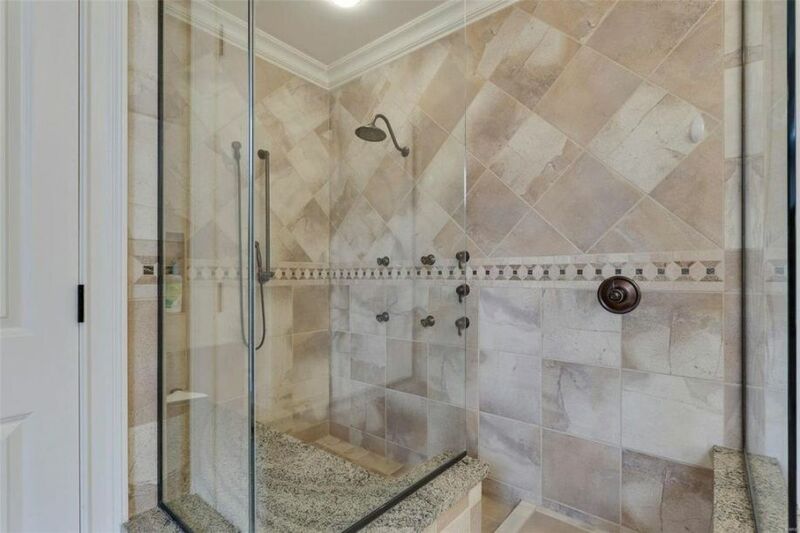 One of the new trends I am seeing for 2019 is the use of shower stalls to break up a large master bathroom. I know that this sounds like an odd look, but it actually works quite well, especially in those oversized bathrooms that are so common these days. This lovely master suite features one of these stall designs placed between the his and hers vanities. I love how the glass shower doors keep the space feeling open, but the stall design gives each occupant a more private space to get ready in the morning. Obviously, this idea is not feasible for all floorplans, but if you are building new or completely remodeling, I would highly recommend considering this layout.